When this card is sent to the Graveyard, you can activate its effect. You can then equip it to a monster on the field, and this card will be treated as an Equip Spell Card that decreases the ATK of th.. If this card is in your hand or Graveyard: You can banish a total of 2 FIRE and/or Dragon-Type monsters from your hand and/or Graveyard, except this card; Special Summon this card. During your opponen..
Machine-Type monster + 1 Pyro-Type monster. Once per turn, during your Main Phase: You can inflict 300 damage to your opponent for each card on the field. 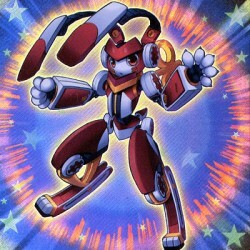 This card cannot declare an attack during the..
"Cyber Dragon" + 1 or more Machine-Type monsters. This monster cannot be used a Fusion Meterial Monster. You can only Special Summon this card from your Extra Deck by sending the above cards from eith.. When this card is Normal Summoned, Flip Summoned, or Special Summoned, you can place 1 "Crystal Beast" monster from your hand, Deck, or Graveyard face-up in your Spell & Trap Card Zone; it is treated .. This card cannot be Normal Summoned or Set. This card cannot be Special Summoned except by having exactly 3 DARK monsters in your Graveyard. You can remove from play 1 DARK monster from your Graveyard..